Thank you messages for birthday party: Write a sweet note to say thanks to someone for throwing an awesome birthday party. An amazing treat deserves a few words of appreciation and if you have attended a cool party, thank the host for inviting you. Whether it is your best friend, professional colleague, boss, classmate or someone else – take ideas from this post to think of quotes you can send as funny text messages, Facebook posts or even as formal notes of thanks. After all, being nice to people who invite you to their parties will definitely secure you a spot in their guest lists for future ones. 1) I am bloating today because I ate too much last night. I am hungover today because I drank too much last night. Obviously I am suffering from the side effects of the awesome birthday party that you threw. Thanks. 2) The awesome birthday party you throw every year makes it totally worth being your friend and tolerating your annoying habits. Thanks for the treat. 3) Birthday celebrations are all about spending time with special people in your life. I am glad that I am one of the special few in your life. Thanks for your birthday party. 4) The real meaning of the word CELEBRATION can never be explained in a dictionary. It can only be understood and experienced in a party like yours. Thanks for giving me the pleasure to attend one such celebration. 5) I am not going to post any pictures of your birthday party on Facebook otherwise everyone will gatecrash next year. Cheers for throwing a good party. 6) Others may have come to your party to eat, drink and dance. But I came to your party to raise a toast to our friendship and celebrate a special day in your life. Thanks for having me over. 7) I don’t mind if you change as a person as the years go by, but never change the guest list for your future birthday parties. Thanks for such a lavish treat. 8) There are no sorrys and thank yous in friendship but you deserve a big thank you for throwing such a fantastic party. Thanks. 9) Your birthday party was just like the friend you have been to me all these years – COOL and GENEROUS. Thanks. 10) The only reason why I never forget to wish you a Happy Birthday in advance is because I would never want to miss out on the best birthday party in town. Oh, and because you are my dear friend too. Thanks for showing everyone a good time. 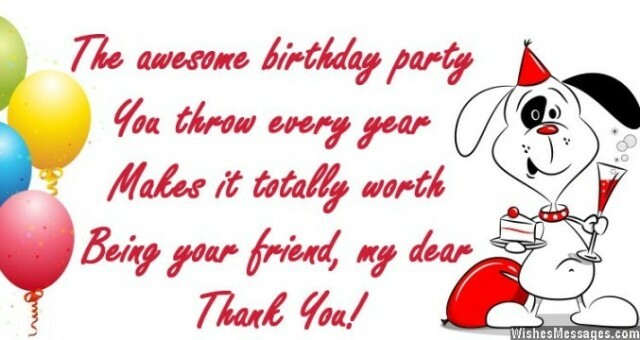 11) By inviting me to your birthday party, you have proved that you have good taste in friends. Thanks. 12) Your birthday party was the perfect personification of fun and happiness. Thanks for inviting me. 13) What do your birthday party, our childhood memories and friendship have in common? I will never forget either of them. Thanks for inviting me to your birthday party. 14) Your birthday party has become the reason why just another day in my life turned into one of the most memorable days of my life. Thanks for throwing such a grand party. 15) Birthdays will come and go, but the superb memories of your birthday party will remain etched in my mind forever. Thanks for throwing such an awesome party. 16) The best thing about attending your birthday party was that I got nostalgic about all the birthdays we have celebrated together as friends. Thanks for yet another addition to my memory bank. 17) Free meal, free drinks and free cake – what’s not to like about your party? Thanks for the treat buddy. 18) I am down with a severe stomach ache because I overate last night – blame it on the food being so good. Thanks for such a lavish treat. 19) Hereby, I officially appoint you as the Chief Event Planner of my 21st birthday party. I sincerely hope that you will recreate the same ambience of your birthday party in mine and give satisfactory results. Warm Regards, your colleague at work. 20) You don’t have to thank me for attending your birthday party. I should thank you for inviting me to your birthday party and giving me the best time of my life. Thanks. 21) I would have been a gatecrasher your birthday party even if you didn’t invite me because I knew it was going to be awesome. Thanks for inviting me in the first place. 22) The servings of food at your birthday party were generous just like your heart. The drinks served at were bubbly just like your personality and the time we spent together was memorable just like our friendship. Thanks for throwing a great party. 23) Event management companies should have been present at your birthday party to understand what a cool, fun and entertaining party is all about. Thanks for the party. 24) Invitations, Save The Date cards, venue, food, drinks, games, music and party favors – from start to finish, your 18th birthday party was perfect. Thanks for making me a part of it. 25) Raving about your party to others is the only thing I will be doing for the rest of the week. Thanks for throwing an awesome birthday bash. 26) Our friendship is permanent, which is why I request you to make my name a permanent feature in any party that you throw in your life including weddings, anniversaries and birthdays. Thank you for the amazing treat on your birthday. 27) You should be given an award for being the Best Host of the Year for throwing such a cool birthday party. Thanks. 28) You have finally revealed your secret to being the most popular guy among all your friends – throwing the best parties. Thanks for having me. 29) Thanks for throwing a fun birthday party and reminding me that we can never outgrow cutting a birthday cake and giving you birthday bumps. Thanks for throwing a grand 30th birthday party. 30) By splurging on a grand birthday party, you have finally proved that you are not a miser after all. Thanks a lot.